If you would like to win this free postcard sketch, comment then email a delivery address (if you haven't already) as per these instructions. 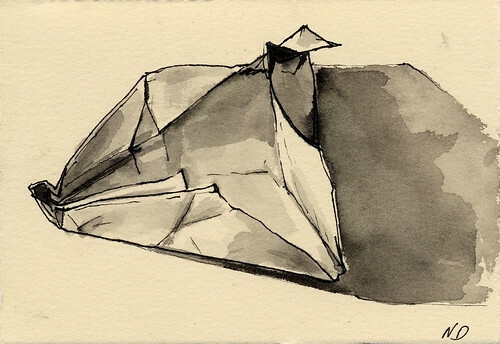 Let me just start by saying that this idea of a crumpled paper airplane is pretty much lifted wholesale from the recent work of Mary Klein. But there's an additional paradox here-- this is a drawing of a 4x6" piece of paper on a 4x6" piece of paper. Try and wrap your head around that one. Speaking of Mary Klein, I signed up on her blog to do a Pay it Forward. But, it being Nablopomo and all, I'm saving that explanation for a later posting. I got out the red Yahtzee cup, and rolled the dice. Between the coin tosses and the previous dice rolls, I seemed to be stuck on "two". Amazingly this roll came up with my first one. Kelly... if you meant to enter for the postcard you are the big winner. I'll leave a note on your blog to send an address. I haven't heard from Kelly regarding address, and I notice she's up north of the border-- I only have 28 cent stamps. I guess that means you are the big winner!